If you are familiar with Cesar Milan’s TV show, “The Dog Whisperer”, you know how important Milan thinks exercise is. Milan is correct when he says that exercise is half of how to train your dog to be more obedient and less destructive. Getting your dog out for his daily walks and play dates goes a long way in your dog’s overall health and happiness, and is the first step in getting a dog, especially a puppy, to behave. 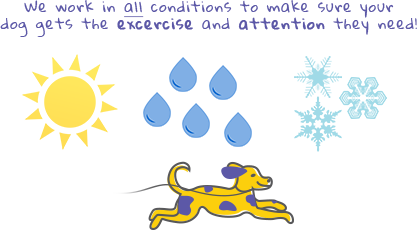 At Hustlin Hounds, we understand how important exercise is to dogs. We also understand that you may have a busy schedule and time is a precious commodity. Our dog walking services are tailored specifically for these kinds of situations. Our dog walking services in the Fort Collins area are tailored specifically for the needs of your pet. Different dogs have different needs, so we take care to listen to you to find out how to help your best friend be all they can be. Our dog daycare is also tailored to help your little helper get the attention and exercise he needs to thrive. Whether you are going on vacation or just need some help socializing your young pup, Hustlin Hounds dog daycare is here for you. We use all of the Fort Collins’ beautiful natural area to get your dog out and exercising and socializing, the way he was meant to. Exercise and socialization can lead to a long, happy, and well-behaved life for your dog. Hustlin Hounds dog daycare and dog walking services are the best in the area because we understand how to handle your dog and what he needs in order to thrive. The dogs at Hustlin Hounds are always happy to be here and love our handlers. If you need dog walkers or a safe, fun dog daycare, make Hustlin Hounds your destination.